If you have a product or service to sell, you probably want prospective customers to find you. For that to happen, you need to rank well on search engine queries relevant to what you do ("Carpenter in Minnesota"). Rank Tracker Professional ($100) is not as comprehensive as the $149 Market Samurai, but it can help you plot and analyze your keyword performance on the path to search-engine stardom. Rank Tracker lets you graph your keywords performance as compared to competitors. Since search engines often change things to make automated searching more difficult, vendor Link-Assistant.com releases periodic "algorithm updates" for Rank Tracker, allowing it to keep using the engines even if they change things around. Rank Tracker comes with six months of free algorithm updates. Once those expire, algorithm updates are $7 per month (or less, if you subscribe for a longer period). Due to Rank Tracker's activity, Google may display CATCHA prompts to users of your network when they try to search the Web. Setting things up is simple: Specify your website and the words you want to rank for, and pick the engines you want Rank Tracker to search. Rank Tracker will then run a search across those engines, and look for your website in the results. It's just like searching for your brand or name to see where you rank, only on a larger scale. Rank Tracker can be used to search for multiple terms across multiple engines, but more important, it can automatically search for those terms day after day and plot the results on a graph, so you can see the gradual change in rank. You can also compare your ranking with up to five competitors. The scheduled search dialog is visible, and requires Rank Tracker to be running in the background. The biggest problem with Rank Tracker is that it uses your own computer to submit the search queries. Some search engines like to tailor results according to your location, so what you see may not be what your target audience sees. You can ameliorate this by searching location-specific editions, but still, you should take the results with a grain of salt. 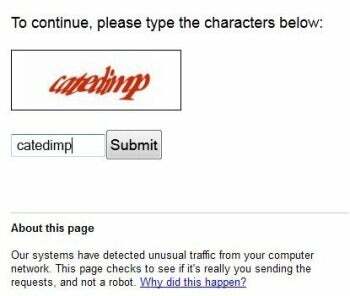 Another issue is that Google doesn't like it when you submit a flood of queries: When I tried to Google something manually shortly after using Rank Tracker, Google popped up an annoying CAPTCHA page and wouldn't let me proceed until I typed the word displayed, to make sure I am not a robot. Worse still, the same thing happened to a different user on my network a few minutes later (she wasn't using Rank Tracker--it was due to my own use). Rank Tracker includes features meant to emulate normal user behavior, but these are switched off by default. Rank Tracker's scheduled task dialog box is large, and pops up whenever a scheduled task runs. Rank Tracker can also suggest potentially useful keywords: Enter a few keywords you want to rank for, and Rank Tracker would query online resources and come back with a list of additional keywords for you to consider optimizing for. It can also compute a Keyword Efficiency Index (KEI) score for each keyword, which shows the ratio between the competition for the term and the search volume (how popular the term is among users). The idea is to find terms that many people search for, but few websites already try to rank for. Rank Tracker is far from perfect, but in the extremely competitive and sometimes messy world of SEO, few tools are. If you are looking for a way to analyze your rankings over time, this is one affordable option. 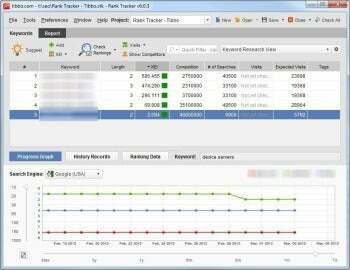 Plot your search engine rankings over time with Rank Tracker.